What’s a Nigerian citizen to do when there’s a presidential election coming up and the two leading candidates are a former dictator who’s presided over four years of lackluster growth and an alleged kleptocrat of international repute? This is the choice facing Africa’s largest oil producer, and by some measures its largest economy, in the Feb. 16 vote. 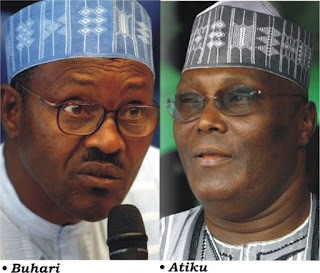 Although the field is crowded, incumbent Muhammadu Buhari, 76, faces his strongest challenge from Atiku Abubakar, 72, who served as vice president from 1999 to 2007 and has tried and failed several times already to secure the top job. Buhari, who led Nigeria briefly in the 1980s as a dictator, came back to power four years ago via the ballot box. After military rule ended in 1999, he contested several elections unsuccessfully before finally becoming the first opposition figure to win the presidency. (He describes himself as a “converted democrat.”) Voters and pundits alike were optimistic that he could diversify the oil-dependent economy, tackle graft, and end Boko Haram’s deadly insurgency. While the stern former general has succeeded in stamping out some of the corruption that’s long blighted Nigeria, critics say he’s been selective, mostly targeting his political opponents. They also say he’s failed on other issues, nicknaming him “Baba Go-Slow” in reference to his age and sluggish response to crises. Nigeria’s economy is still smaller on a per capita basis than it was in 2014, when it was hammered by the crash in crude prices. Unemployment has surged to a record 23 percent from 6.4 percent at the end of 2014. The stock market has been the world’s worst performer since Buhari came to office, falling more than 50 percent in dollar terms. Boko Haram militants, some affiliated with Islamic State, continue to wreak havoc in the northeast. Other parts of the country have been roiled by a conflict between farmers and herders that’s led to thousands of deaths. Abubakar, widely known as Atiku, is a father of 26 who has business interests ranging from oil and gas services to food manufacturing. He’s pledged to loosen the state’s grip on the economy, end the naira’s peg to the dollar, and privatize companies including the Nigerian National Petroleum Corp., which dominates the local energy industry. But for all his market-friendly talk—he admires the late Conservative U.K. Prime Minister Margaret Thatcher. Many Nigerians think he used his past positions in government to enrich himself. Still, any bounce could be short-lived. Abubakar may not risk the political fallout from trying to sell state assets or, as he’s also promised, removing a cap that keeps Nigeria’s gasoline prices among the cheapest in the world. BOTTOM LINE – No matter who wins Nigeria’s presidential election, the economy is unlikely to improve, setting up the nation for a humanitarian catastrophe in the coming decades.